Home Air Travel	What can you do if your child’s car seat doesn’t fit in the airplane seat? As discussed in the post “Will your car seat be allowed on the airplane?”, whenever boarding an airplane you should be ready and able to point to the FAA approval on your car seat (side or bottom label) or in your car seat’s manual in some cases. But even if you car seat is approved for air travel, you might suddenly find yourself in a situation known to many veteran family travelers – the same car seat that fit in the last airplane you took doesn’t fit this time around. It’s easy to get frustrated, especially as you struggle to get the seat into place while shielding your child from other passengers hoisting lead-weight carry-ons over your heads and flight attendants urge you to either get that car seat in place or gate-check it so everyone can get on their way (yes, we pay for this service). Not long ago, a mom who tried to stand her ground about using her child’s car seat was even told to get off the plane altogether. I hope you never find yourself in a tough situation like this, but in case you do it will be helpful to know your rights—and a couple of tips ahead of time that may help you avoid having to exercise them. 1) Never fly with a car seat over 18” wide (16” is recommended by the FAA but practically non-existent among car seats). Some infant car seats have bases that exceed this, but most can also be installed safely without their bases using the airplane safety belt (see your manual). 2) Use a car seat with a narrow footprint and raised base to ease installation between arm rests with the safety belt. 3) If you want or need to install your child’s car seat rear-facing, reserve bulkhead seats to ensure an adequate degree of recline without running into a forward passenger’s seat—but make certain you follow point one above since arm rests on bulkhead rows typically cannot be raised to allow for extra room. (1) A CRS with a base that is too wide to fit properly in a seat with rigid armrests can be moved to a seat with moveable armrests that can be raised to accommodate the CRS. (2) An aft-facing CRS that can not be installed properly, because of minimal pitch (distance between seats) between rows, can be moved to a bulkhead seat or a seat in a row with additional pitch. Of course, if the car seat won’t fit in any seat in coach, you will still be obliged to gate-check it for the flight. But in case there is another viable option, it’s up to the airline to help you—and possibly other passengers—make the switch. 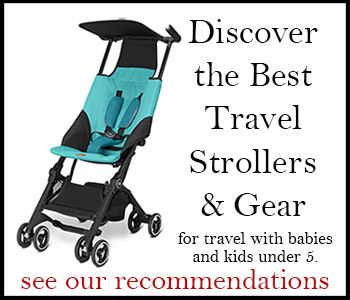 For more tips on installing car seats in airplanes (and keeping young kids entertained, diapered, and happy in flight), see the On the Go section in Take-Along Travels with Baby. Will your child’s car seat be allowed on your next flight? Should more airlines ban babies from first class – or business class? Problem is that once you check your car seat, it is the same as it being in a crash due to the splendid care that is taken with checked luggage. It could be damaged some place you can’t see, and fail in a subsequent vehicle crash. You’re probably better off forward-facing the seat – even if your child should be rear-facing (is under three and still fits the rear-facing limits of the seat) – than you are to let them check it. I personally just bought a Cosco Scenera (basic convertible seat, $40 at Walmart) specifically to travel with. Great information! I have definitely had the experience of the car seat not fitting. Especially in the bulkhead seats. Just wanted to mention that at most airlines, there is no fee to check (in baggage or at the gate) “assisting devices”. A car seat would fit in this category. At least that’s ONE thing you don’t have to worry about being charged for!